Animefringe: Reviews - Princess Nine Vol.6: Grand Slam! 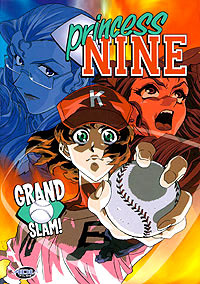 Princess Nine Vol.6: Grand Slam! One of those rare endings that you'll remember for years to come. The Kisaragi Girls School is down to the wire, the regional preliminaries are about to begin, and the team is looking a little worse for wear. Yuki has become a total basket case, Izumi is completely out of it and Ryu is burning up with anger. How can these girls hope to get past their problems and differences and work together like a finely tuned machine? Tears, hope, and redemption - These are the things that are embodied within the final volume of Princess Nine. For those expecting a normal review that'll ruin the final volume… Forget it. Instead, I'd like to share some of the grand feelings I experienced while watching this show. First and foremost, through the final five episodes I was stuck, literally glued to my seat. I couldn't take my eyes off the screen. Sure, a lot of anime can keep you glued, but I didn't even want to get up to get a drink or anything. I just wanted to sit there focused on the series. I was afraid to even swallow for fear of missing some important dialogue. Yeah, that's a bit extreme, but it's true. I laughed, I cried, I chewed my fingernails to the bone from the angst. I was completely drained after I had finished the series. All I wanted to do was jump on my computer and talk about what I had just seen. It's a true testament to the power of a series when you can be moved. Princess Nine managed to move me in every volume. The way the character's stories seem to have all come together in these final episodes really goes to show how well the story was plotted. There is one minor blemish and that involves Koharu's father suddenly getting sick. Though it shows that one person's problems do affect everyone, it really seems to have been forced into the overall story when considering that the main players in the final episodes are Ryu, Izumi, and Hiroki. The extras are a bit sparse this time as the key new extra is a Japanese cover art gallery. Returning once again are the clean opening and ending scenes and some previews. You can't tell me you buy anime for the extras, they are nice to have, but it's the program that is the main draw. All the rest is just toping. Once again, the English voice cast has done a remarkable job making this the series one of the spotlight ADV dubs. Though Steel Angel Kurumi is a superior dub in terms of voice action, the script has been altered dramatically. Princess Nine does have some minor changes such as Ryu's nickname of Tofu, the dub and sub are virtually the same program making it a much purer show in that respect. Whether you watch this show dubbed or subbed, the experience is the same. But one thing is for certain, you owe it to yourself to check out this series. Sure it's a sports drama, but the sports part is only a small part of the bigger picture. Heck, the market needs some more sports series as it is, so why not pick up one of the best? Original Material © 1999 / 2002 Animefringe, All Rights Reserved.